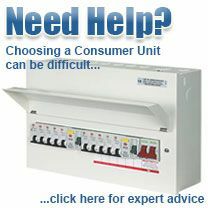 The VML120, 20 Way Hager Consumer Unit is supplied empty with just the 100a main isolating switch. This allows for complete freedom of configuration. You may populate the VML120 with a bank of 18 x MCBs and 1 x RCD or 20 x RCBOs for total circuit separation. Both configurations comply with the 17th Edition Regulations - the second option offers superior circuit separation. We also supply these 20 Way Hager Consumer Units..
With two banks of 10 ways this consumer unit offers highly versatile configuration, allowing for both RCBO and MCB protection. The same single bank layout as the VML120, but maybe recessed into the wall for discrete installation. Single bank layout but with curvy lines for installation in visible areas.